...GET IT SHIPPED Free Auto Shipping Quote: 1949 Chevrolet Coupe. Running 235 c.i. 6 Cylinder, 3 Speed on Column. 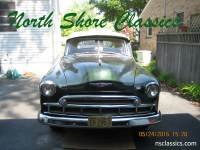 ...Seller's Vehicle Description .1949 Chevrolet Coupe Running 235 c.i. 6 Cylinder, 3 Speed on Column.